St. Vincent of Saragossa, one of the greatest deacons of the Church, suffered martyrdom in Valencia in the persecution under Diocletian. He was born in Huesca, Spain. According to the 1962 Missal of Bl. John XXIII the Extraordinary Form of the Roman Rite, today is also the feast of St. Anastasius, a Persian monk who was beheaded in 628. According to the 1962 Missal of St. John XXIII today is the feast of St. Raymond of Penafort which is now celebrated on January 7 on the General Roman Calendar. It is also the commemoration of St. Emerentiana whose veneration is connected with that of St. Agnes. She was venerated at Rome not far from the basilica of St. Agnes-Outside-the-Walls on the via Nomentana. The acts of St. Agnes make Emerentiana her foster sister; according to this source, while still a catechumen she was stoned at the tomb of the youthful martyr where she had gone to pray. 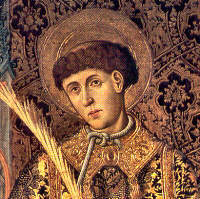 Vincent of Saragossa was one of the Church's three most illustrious deacons, the other two being Stephen and Lawrence. He is also Spain's most renowned martyr. Ordained deacon by Bishop Valerius of Saragossa, he was taken in chains to Valencia during the Diocletian persecution and put to death. From legend we have the following details of his martyrdom. After brutal scourging in the presence of many witnesses, he was stretched on the rack; but neither torture nor blandishments nor threats could undermine the strength and courage of his faith. Next, he was cast on a heated grating, lacerated with iron hooks, and seared with hot metal plates. Then he was returned to prison, where the floor was heavily strewn with pieces of broken glass. A heavenly brightness flooded the entire dungeon, filling all who saw it with greatest awe. Patron: Portugal; vine dressers; vinegar makers; vintners; wine growers; wine makers. Symbols: Deacon holding a ewer; deacon holding several ewers and a book; deacon with a raven; deceased deacon whose body is being defended by ravens; deacon being torn by hooks; deacon holding a millstone. Read this account of St. Vincent's martyrdom. Pray to St. Vincent for those ordained deacons in the Church, especially those in your own parish. Read Acts of the Apostles 6:1-7 to discover the role of deacons in the early Church. Cook a Spanish dish in honor of St. Vincent. St. Emerentiana was a Roman virgin, the foster sister of St. Agnes who died at Rome in the third century. Already as a catechumen she was conspicuous for her faith and love of Christ. One day she boldly upbraided the idolaters for their violent attacks on the Christians. The enraged mob retaliated by pelting her with stones. She died in the Lord praying at the tomb of St. Agnes, baptized in her own blood. A church was built over her grave which, according to the Itineraries, was near the church erected over the place of burial of St. Agnes, and somewhat farther from the city wall. In reality Emerentiana was interred in the coemeterium majus located in this vicinity not far from the coemeterium Agnetis. Patron: Those who suffer from digestive disorders. Symbols: Young girl with stones in her lap, usually holding a palm or lily. St. John was married, but when his wife and two children died he considered it a call from God to lead a perfect life. He began to give away all he possessed in alms, and became known throughout the East as the Almoner. He was appointed Patriarch of Alexandria; but before he would take possession of his see he told his servants to go over the town and bring him a list of his lords-meaning the poor. They brought word that there were seventy-five hundred of them, and these he undertook to feed every day. On Wednesday and Friday in every week he sat on a bench before the church, to hear the complaints of the needy and aggrieved; nor would he permit his servants to taste food until their wrongs were redressed. The fear of death was ever before him, and he never spoke an idle word. He turned those out of church whom he saw talking, and forbade all detractors to enter his house. He left seventy churches in Alexandria, where he had found but seven. A merchant received from St. John five pounds weight of gold to buy merchandise. Having suffered shipwreck and lost all, he had again recourse to John, who said, "Some of your merchandise was ill-gotten," and gave him ten pounds more; but the next voyage he lost ship as well as goods. John then said, "The ship was wrongfully acquired. Take fifteen pounds of gold, buy corn with it, and put it on one of my ships." This time the merchant was carried by the winds without his own knowledge to England, where there was a famine; and he sold the corn for its weight in tin, and on his return he found the tin changed to finest silver. St. John died in Cyprus, his native place, about the year 620.